AJ Landscapes - Driveways/Patios/Paths, Landscaper based in Holbury, Hampshire. 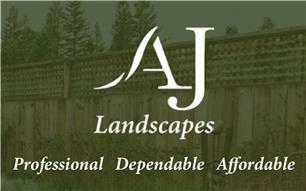 Welcome to AJ Landscapes, we are a family run business based in the waterside area. Our professional team have many years of experience in all aspects of hard and soft landscaping. No job is to big or too small. We always work to a high standard to impress our customers. Please contact us now for a FREE quotation or if you have any enquires please don't hestitate to contact us! Check out our photo albums for work carried out by our team! !